Green Knob Overlook: Blue Ridge Parkway, N.C. Welcome to North Carolina. Here's a state that embraces you with gorgeous mountains and hills, hundreds of lakes and rivers, waterfalls, and a very desirable climate. The economy is varied, ranging from an established agricultural sector, to areas of industrial and high tech growth. From the grandeur of the Great Smoky Mountains, and the beauty of the Blue Ridge Parkway, to the coast and the fragile islands of the Outer Banks, North Carolina has plenty to offer. And with her mild winters and comfortable summers, North Carolina is a great place to live, and a very attractive place to visit again and again. 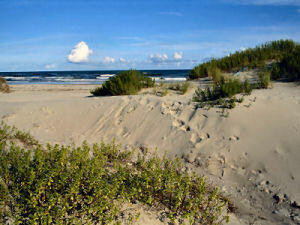 David Stick has written about the Outer Banks of North Carolina for over 50 years. Now, he is letting others tell a story that spans over 450 years. He has collected the words of others in this one of a kind anthology describing the chain of barrier islands off the North Carolina coast. An Outer Banks Reader is for those who have experienced the allure of this fascinating place and for those who surely will. North and South Carolina were one colony until 1729. Carolina was named to honor Charles IX of France and then Charles I and Charles II of England. 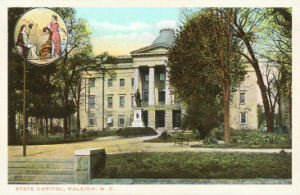 Carolina is rooted in Latin and comes from the word Caroliinus. This word is derived from the name Carolus, translated as "Charles." In North Carolina's early years, tar was one of the state's major products. Tar is a dark brown or black sticky liquid created by the decay of organic material such as wood, coal or peat. There are two contradictory stories about the origin of this nickname. Both stories concern Civil War battles in which North Carolina troops were involved. John S. Farmer's Americanisms - Old and New , published in 1889, tells of a battle involving Mississippi and North Carolina soldiers. The story goes that, during a battle, a brigade of North Carolinians failed to hold their position. The Mississippians taunted the North Carolinians with failure to tar their heels that morning. They meant by this that, if the North Carolinians had tarred their heels, they would have been able to "stick" to or hold their position. North Carolina soldiers come out of a story by Walter Clark looking a little more heroic. In Mr. Clark's story, the North Carolinians had to fight it out alone after their supporting column failed to hold their position. The story goes that the derelict outfit (It's implied that they were from the Army of Northern Virginia.) later asked "Any more tar down in the Old North State, boys?" The North Carolinians responded "No; not a bit old Jeff's bought it all up." "Is that so; what is he going to do with it?" the derelicts asked. The reply; "He's going to put it on you'ns heels to make you stick better in the next fight." "Old Jeff" is a reference to the President of the Confederate States of America, Jefferson Davis. "Where soars Mount Mitchell's summit great, In the "Land of the Sky," in the Old North State!" 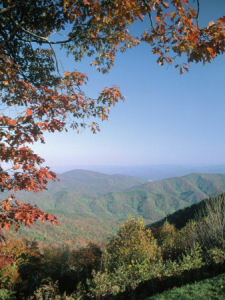 The city of Asheville, North Carolina has also adopted "Land of the Sky" as its nickname. In 1710, Carolina was divided into northern and southern sections. The southern section was called South Carolina and the northern section was called North Carolina. "The Old North State" is a reference to the northern section. The principal products of North Carolina in its early history were tar, pitch and turpentine. It is from the latter that this nickname is derived. Large quantities of turpentine were produced from North Carolina pine forests. This nickname was mentioned in C.J. Thomas's Manual of Useful Information but no explanation for it was given. We could speculate that northern visitors may have compared the mountains of North Carolina to the Catskill mountains of New York where the Rip Van Winkle legend was publicized by Washington Irving. People who live in North Carolina or who come from North Carolina are called North Carolinians. North Carolina was the 12th state to enter the Union and the North Carolina Commemorative Quarter is the 12th to be released in the series. The North Carolina quarter celebrates the first airplane flight, with a picture of Orville and Wilbur Wright's plane taking off and the inscription "First Flight." They said it couldn't be done. 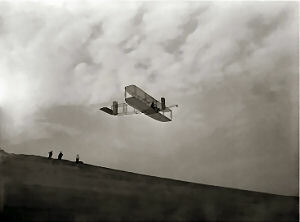 But on December 17, 1903, at the beach near Kitty Hawk, North Carolina, a man actually flew through the air. Orville Wright makes history in the Flyer. The pilot was Orville Wright, who with his brother, Wilbur, designed the first motorized flying machine. Called the Flyer, it traveled a distance of approximately 37 meters (120 feet) on its first flight, staying in the air for twelve seconds. The Wright brothers chose the Kill Devil Hills beach near Kitty Hawk for a good reason. They had soft sand for a gentler landing. Clark, Thomas (Editor), Histories of the Several Regiments and Battalions from North Carolina in the Great War 1861-65 . Nash Brothers Book and Job Printers, Goldsboro, NC - 1901. North Carolina (From Sea to Shining Sea) , by Nan Alex. 80 pages. Publisher: Scholastic Library Publishing (September 2001) Reading level: Grades 3-5. Presents information about North Carolina's people, geography, history, landmarks, natural resources, government, state capitol, towns and cities, and more. North Carolina (World Almanac Library of the States) , by Sarah Rafle. 48 pages. Gareth Stevens Publishing (January 1, 2002) Reading level: Grades 4-6. Filled with the most up-to-date information, including the latest Census results. Full-color photos bring to life the story of North Carolina. In addition to an in-depth factual profile of North Carolina in the form of a state Almanac, this book offers fascinating and lively discussions of the state's history, people, geography, government, economy, culture, and lifestyles. A section on Notable People, a calendar of events, and enough primary source documents, time lines, maps, and other tools to make this unquestionably the best young adult reference material on the USA available anywhere. Encyclopedia of North Carolina , edited by William S. Powell. 1328 pages. Publisher: The University of North Carolina Press; Second Printing edition (October 25, 2006) The first single-volume reference to the events, institutions, and cultural forces that have defined the state, the Encyclopedia of North Carolina is a landmark publication that will serve those who love and live in North Carolina for generations to come. Editor William S. Powell, whom the Raleigh News & Observer described as a "living repository of information on all things North Carolinian," spent fifteen years developing this volume. With contributions by more than 550 volunteer writers--including scholars, librarians, journalists, and many others--it is a true "people's encyclopedia" of North Carolina. The Tar Heel State: A History of North Carolina , by Milton Ready. 404 pages. Publisher: University of South Carolina Press (October 31, 2005) In the last three decades North Carolina has witnessed a remarkable growth in population, economic development, and political importance, and it now ranks as the tenth most populous state in the Union. The Tar Heel State: A History of North Carolina constitutes the most comprehensive and inclusive single-volume chronicle of the state's storied past to date, culminating with an attentive look at recent events that have transformed North Carolina into a southern megastate. Integrating tales of famous pioneers, statesmen, soldiers, farmers, captains of industry, activists, and community leaders with more marginalized voices, including those of Native Americans, African Americans, and women, Milton Ready gives readers a view of North Carolina that encompasses perspectives and personalities from the coast, "tobacco road," the piedmont, and the mountains in this sweeping history of the Tar Heel State. The first such volume in more than two decades, Ready's work offers a distinctive view of the state's history built from myriad stories and episodes. North Carolina: A History , William S. Powell. 248 pages. Publisher: University of North Carolina Press (October 1988) A leading authority on the people and events that have shaped North Carolina over four centuries, Powell here provides a sharply drawn overall history of the state for general readers. In twelve chapters this volume traces North Carolina's history from England's initial efforts to found a colony in America in the sixteenth century to uncertain and often-turbulent times as the final quarter of the twentieth century approached. North Carolina Through Four Centuries , William S. Powell. 607 pages. Publisher: The University of North Carolina Press (August 1, 1989) This successor to the classic Lefler-Newsome North Carolina: The History of a Southern State , published in 1954, presents a fresh survey history that includes the contemporary scene. Drawing upon recent scholarship, the advice of specialists, and his own knowledge, Powell has created a splendid narrative that makes North Carolina history accessible to both students and general readers. For years to come, this will be the standard college text and an essential reference for home and office. Winner of the 1989 Mayflower Cup for Nonfiction, Society of Mayflower Descendants in the State of North Carolina.